Most companies only offer fixed configurations, however because of the high cost and complexity of these technologies, we prefer to custom-build complete end-to-end solutions based directly on the customer’s specifications and budget. Every situation is unique and has different needs; we want to ensure that you’re getting the best value solution with the performance you require. With our experience in critical infrastructure and technological expertise, we can design products to suit any application from industrial to global enterprise. We offer our full customization at a fraction of the time and cost of our competitors, and our customized approach gets you a complete end-to-end solution based on your specific requirements. Product marketing in this industry can be misleading and confusing. Often decisions are made based on product specifications (which are calculated with ideal scenarios in mind) without considering how the project site’s environment will affect performance. We believe in providing an effective and honest solution and are available to educate our customers on any concepts they may be unfamiliar with. Take advantage of our in-depth knowledge of security solutions. We make it our business to learn every available option and do not limit ourselves to specific technologies, which allows us to find the best solution for your application. We can help you understand anything you might want to know about ZLID, thermal, infrared, DRI, zoom factors and more. Trust that we will put our vast knowledge to work, weigh your budget with your needs and provide you with the very best bang for your buck. We are wholeheartedly committed to the quality and performance of our products in your specific situation. If you’re not satisfied, neither are we. Infiniti Electro-Optics is a division of Ascendent Technology Group, which has been a manufacturer of CCTV cameras, PC‑based DVRs/NVRs and IR night vision cameras since 2000. 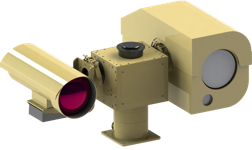 In 2008, Ascendent was one of the pioneers in long-range IR laser illumination when they released ZLID technology integrated into a turnkey PTZ system. Due to growth and demand for long-range EO/IR cameras, in 2011 Ascendent realized the need for a focused division specifically dedicated to R&D, support, and production of advanced long-range electro-optics, and Infiniti Electro-Optics was created. Infiniti has produced some of the highest quality and longest range electro-optics systems, including systems with 1200mm cooled thermal, 5500mm visible/IR lens, 5km ZLID illumination and Elliptical Synchronous Drive pan tilt systems with advanced gyro stabilization. We have worked on numerous military, MOD, marine, and critical infrastructure projects, and sold systems to over half of the top ten US defense contractors. Our camera systems have endured some of the harshest environments, with deployment by the US military in desert, marine and arctic conditions. Infiniti Electro-Optics is a company that is continually striving to push the level of surveillance security by creating and using the most advanced technology available. We aim to lead the market while maintaining a candid relationship with customers, unmatched quality in our products and most importantly integrity in our business. Infiniti puts the customer first with solutions that are designed and built with the client’s needs as the main priority. Let us design the ideal custom solution for you.